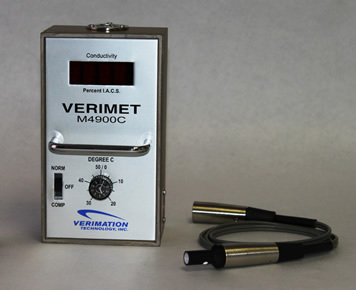 M4900C - Verimation Technology Inc.
Verimation’s M4900C is well suited for measuring the conductivity of aluminum alloys. It automatically tracks the temperature coefficient. The M4900C works well on rough or finished surfaces, including forging, castings, sheets stock, and small parts of reasonable mass. Production line conductivity instruments and systems are available for rapid automatic sorting or process control requirements. Lift-off: 0.025 inch 0.906mm) max. Power Supply: Rechargeable Nickel Cadmium Batteries w/AC adapter/Battery Charger 115/60 Hz or 220/50 Hz.